How to record increase or decrease in purchase and sales price with GST? Tally.ERP 9 release 6.4.1 provides options to capture information required for an e-way bill. You can export this information in the JSON format and upload it directly to generate an e-way bill. With Tally.ERP 9, the task of identifying invoices that can be consolidated is simplified. All the invoices with e-way bill numbers are displayed in a report. At the click of a button Tally.ERP 9 will group the invoices based on consolidation rule. You can select any group and export the same in JSON format. The JSON file with the details of the consolidated transactions can be uploaded to the e-Way bill portal to generate the consolidate e-Way bill. You can update the e-Way bill number in Tally.ERP 9. With Tally.ERP 9, you can maintain ledgers for additional charges like Commission, Packaging Charges, Trade Discount, Cash Discount, other discounts, and so on. You can apply additional charges in an invoice using these ledgers and include the value of these ledger to calculate tax. Watch this video to learn how to easily upgrade to the latest of Release of Tally.ERP 9. The inbuilt upgrade feature will list all the latest releases of Tally.ERP 9. You can choose any release and upgrade instantly. You can generate e-Way bills for invoices recorded in Tally.ERP 9. The printout of tax invoice recorded in Tally.ERP 9 provides all the information required to generate an e-Way Bill, such as transaction type, invoice number and date, party address and GSTIN, item name and HSN Code, taxable value, and tax amount. The transporter details will also appear in the printout if they were recorded in the invoice. Watch this video to learn how to easily upgrade to Tally.ERP 9 Release 6.5. The inbuilt upgrade feature lists all the latest releases of Tally.ERP 9. You can choose any release and upgrade instantly. 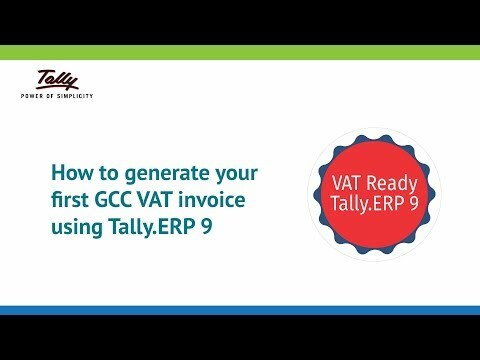 Watch this video to learn how to use Tally.ERP 9 for your Bahrain VAT compliance. You can quickly install Tally.ERP 9, create a company, enable VAT, record and print VAT invoice in Arabic, English, or both. VAT 201 report in Tally.ERP 9 is a single source of information for the data used in filing VAT returns. The report gives you complete information of the transactions included in the returns, put on hold (corrections required) and excluded from returns. It enables you to check each and every value by allowing drill down to subsequent levels. And, finally it exports the return details to PDF in the exact format as the VAT form on the department portal. 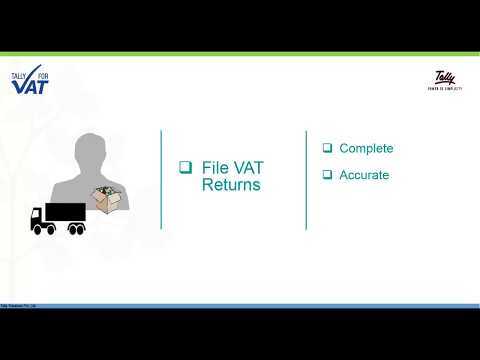 VAT Return report in Tally.ERP 9 is a single source of information for the data used in filing VAT returns. The report gives you complete information of the transactions included in the returns, put on hold (corrections required) and excluded from returns. It enables you to check each and every value by allowing drill down to subsequent levels. And, finally it exports the return details to MS Word in the exact format as the VAT form on the department portal. 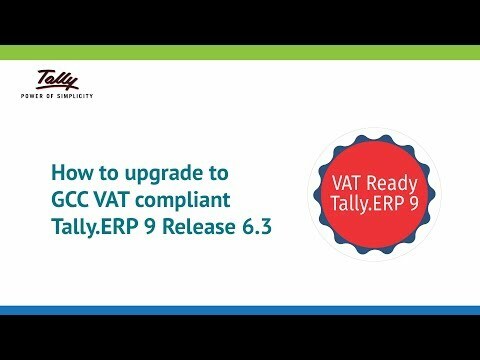 Watch this video to learn how to enable GCC VAT in Tally.ERP 9 Release 6.3. You will also learn how to quickly set-up the masters, and record and print a VAT invoice. Watch this video to learn how to easily upgrade to Release 6.3 of Tally.ERP 9. The inbuilt upgrade feature will list all the latest releases of Tally.ERP 9. Users on Release 5.0 or later releases can upgrade instantly. Users on Release 4.93 or previous releases can download and install Release 6.3. 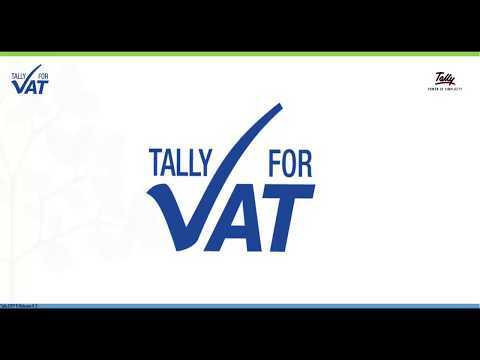 Watch this video to learn who to use Tally.ERP 9 for your business VAT compliance. You can quickly install Tally.ERP 9, create a company, enable VAT, record and print VAT invoice, and generate VAT returns.